RSS floats ‘Shri Ram Mandir Nirman Sahayog Manch’ to build up mass support for Ayodhya Ram Temple. Ayodhya: RSS floats a new outfit to build mass support for Ram temple while Supreme Court hears case. Dhirendra K Jha | Scroll in Online | Lucknow | Oct 25, 2017:: The Rashtriya Swayamsevak Sangh has floated a new affiliate to whip up support for a Ram temple to be constructed in Ayodhya even as the Supreme Court prepares to begin hearing final arguments in the Ramjanmabhoomi-Babri Masjid case from December 5. Launched nearly a month ago, the Shri Ram Mandir Nirman Sahayog Manch has already organised a series of meetings in Ayodhya and Lucknow with Hindu and Muslim religious leaders, in addition to prominent Buddhists, Jains, Sikhs and Christians. “By the time the Supreme Court starts hearing the case from December 5, we will be in a position to show enough support for Ram temple in Ayodhya as well as in other parts of Uttar Pradesh,” said the Manch’s national convener and senior RSS pracharak Mahiraj Dhwaj. The case before the Supreme Court involves the question of who owns the plot in the Uttar Pradesh town of Ayodhya on which the Babri Masjid stood until it was demolished on December 6, 1992, by a mob moblised by the Bharatiya Janata Party. Some Hindus believe that the mosque was constructed over the exact site where the god Ram was born. In the organisational structure of the Sangh Parivar, the new affiliate functions under the supervision of the Muslim Rashtriya Manch, whose head, senior RSS leader Indresh Kumar, is the chief patron of Shri Ram Mandir Nirman Sahayog Manch. In fact, Dhwaj too is from the Muslim Rashtriya Manch, serving as its national co-convener for Uttar Pradesh and Uttarakhand. 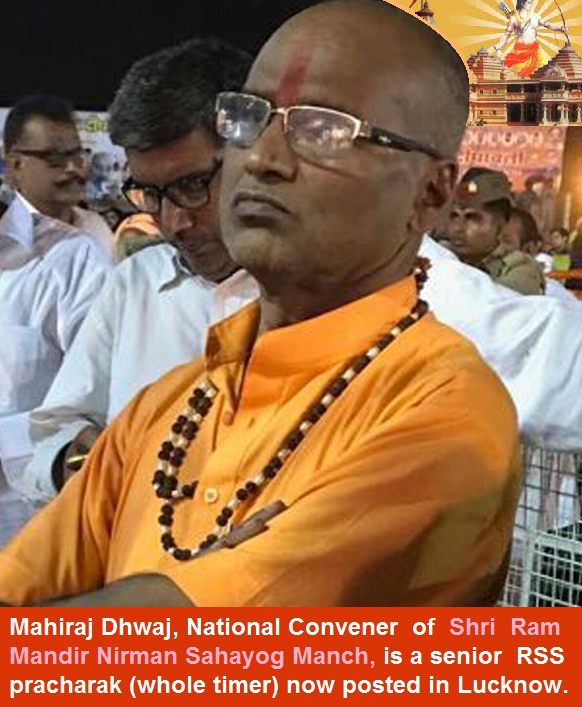 Dhwaj said the new outfit organised its first meeting on September 17 in Ayodhya, “where over 3,000 Muslim clerics extended their support for the temple”. Kumar also attended the meeting. Dhwaj described Shri Ram Mandir Nirman Sahayog Manch as an “outfit of the masses” that will be supported by “like-minded organisations”. He listed some such organisations: Vishwa Hindu Parishad, Muslim Rashtriya Manch, Rashtriya Ekta Mission, Masihi Mitra Manch, Bharat Tibet Sahyog Manch, Himalay Parivar, Sanatan Sabha, Shri Jagannath Sewa Samiti, Rashtriya Suraksha Jagaran Manch, Bhrashtachar Mukti Andolan. These are all part of the Sangh Parivar. The decision to float a new outfit to build support for the construction of a Ram temple “on behalf of the masses” while the Supreme Court hears the dispute rather than entrust the task to the Vishwa Hindu Parishad, which has long spearheaded the Ram temple movement, is seen as a clever move by the RSS to deflect potential allegations of contempt of court. The new affiliate has already demonstrated its standing within the Sangh Parivar. It was given a central role in organising the “Chhoti Diwali” of Chief Minister Adityanath in Ayodhya on October 18. The Shri Ram Mandir Nirman Sahayog Manch is now planning a five-day programme in Lucknow starting October 30 “to worship Lord Hanuman in order to remove obstacles for the construction of Ram Temple in Ayodhya”, Dhwaj said. Then, he added, they will organise a “massive programme” in Ayodhya in the third week of November. This entry was posted on October 25, 2017 by hinduexistence in Ayodhya Ram Janmabhoomi Temple Movement, Demand for Ram Temple at Ayodhya, Ram Janmabhoomi Temple Movement, Save Ayodhya and Ram Janambhoomi Temple and tagged Bharatiya Janata Party (BJP), building up mass support for Ayodhya Ram Temple, Mahiraj Dhwaj, Ram temple case pending in Supreme Court, Ramjanmabhoomi-Babri Masjid case, Rashtriya Swayamsevak Sangh (RSS), Shri Ram Mandir Nirman Sahayog Manch.